As a child, I spent summers and school holidays with my father. For three years during the mid 1970s, we spent summers driving cross-country in a tricked-out Dodge van, complete with wood paneling and an apartment piano in the back. 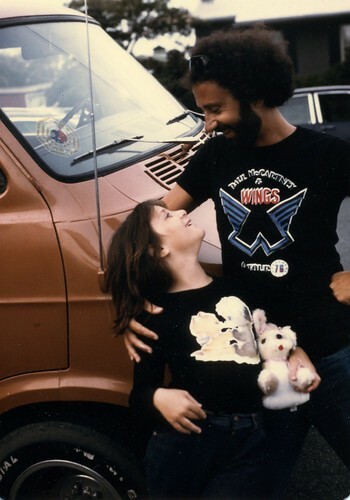 My dad would pick a place to stop, we'd open the back doors and perform The Steven and Julie Show, singing the songs I grew up with: Fun, Fun, Fun by The Beach Boys, The Night Chicago Died by Paper Lace, Runaway by Del Shannon, and so many more. "Safe adventure," my dad liked to call it. The only Fourth of July that stands out in my memory was from one of those vanning trips. I have no idea where we were — Kansas, maybe. We had made some new group of friends for the day or the week, and I remember sitting on the sidewalk lighting sparklers and those strange, snake-like things that just grew along the ground when you lit them. I do remember that we'd made sure to be in a state that allowed you to pick up fireworks at a stand along the road for the Fourth, since you couldn't do that everywhere. The Fourth meant a lot to my dad. He was an unlikely patriot, in a way. A hippie musician, but also a civil-liberties lawyer who once explained to me that he would defend a Nazi's right to march (we are Jews) rather than see a person's civil rights taken away. He was mortified by what was happening to this country during the last years of the Bush Administration. And then, in a way that seems oddly fitting, my dad died on the Fourth of July, 2007. So during this holiday weekend, when everyone is celebrating and enjoying being with family, I am thinking of him. I love you, Dad. I hope somewhere you're riding along in a tricked out van with a piano. And that this time you get to be the one who wrote Runaway. I could send a private message to Julie, of course, but I'd just as soon share my memories of Stevie with all of his compatriots. First, I'm very proud of him for being the patriot and libertarian he was; I totally agree with his sentiments about defending to the utmost the right of another person to express his opinion, regardless of how seemingly outrageous. Those of us who share such sentiments are the true patriots, and deeply understand and appreciate the importance of freedom in all of its manifestations. Second, I guess I never really caught on to the fact that he died on July 4 - how very appropriate! I continue to miss my great friend, almost on a daily basis. I have no one I can call with whom to share those special and particular sentiments, much less a huge variety of other topics. One thing we shared regularly was ideas for various inventions, from slight computer application developments to full-on and quite involved inventions. (Those of you who knew of Stevie's and my various shared projects still don't know of the almost-daily ideas we would share, from the minor to the grandiose.) I will miss him until the day I join him and continue those revelations. My greetings and salutations to all! Best, "Rogie"
This was a wonderful tribute. I didn't know that you traveled with him like this. It's so hard when we lose the people we love and have to learn to continue without them. I love you girl. Steven was a vital person, full of energies for all his projects and---most of all---for living his life. He reached out to other people and I am one of many whom he befriended and helped just by his understanding and enthusiasm. I miss him greatly. This is so special Julie. Thank you for posting this here so I could learn more about you. What a GREAT photo too. Wow.